Sound "Engaging speakers" that "pull you up closer to the stage where everything sounds more present and robust"; Tim was "surprised at the extent to which the Paradigms were able to act like little monitors" and disappear sonically; but "what the Paradigms do extraordinarily well is bring a sense of size and scale to a performance, especially to larger arrangements." mineral-filled polypropylene cones"; "the speakers themselves seem very well put together." Use "Paradigm makes much of the grilles, maintaining that they are engineered to eliminate edge diffraction and that the speakers are meant to be used with them in place," but Tim removed the grilles and "got an extra dollop of air and reverb that largely restored what had been missing." Value "A truly first-class effort capable of legitimately running with speakers twice its cost -- and maybe even more." I love a bargain, but I especially love a bargain when I can find it in the wonderful world of high-end audio. Theres just something about getting 90% or more of what the megabuck crowd is getting for a relative song. I also find a certain level of satisfaction knowing that by using my brains and some effort I can do as well, and in many cases better, than those who just throw money at the issue. As I survey the audio-equipment landscape its hard to come up with a better value-per-dollar segment than small monitor speakers. Anyone who has been reading Doug Schneiders reviews of these little wannabe giant killers should understand. Of course, the major caveat comes in the lower octaves where physics inevitably takes over, but from the midrange on up, the sound-quality gap between the leastest and the mostest has shrunk rapidly. 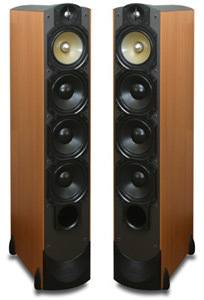 I think that close on the heels of the mini giants in the value race would be the floorstanding speaker segment in the $2000 to $3000 USD range. In this heavily populated sweet spot of the speaker world you still dont get the super-tight, ultra-mega bass of the high-dollar-behemoth set, but you can get to the point where a subwoofer is optional. And when you start to add it up, the fact that you can forgo both a subwoofer and speaker stands makes these reasonably sized yet overachieving towers seem like even more of a bargain. Enter the Paradigm Studio 100 v.3. As the name implies, these speakers have been around for some time, and, as with the Porsche 911, Paradigm thinks enough of the basic design that they see fit to continually improve the species rather than reinvent it. I have to say that I also think highly of the basic premise of a narrow tower with multiple smaller drivers. Not only does such a design offer potential benefits in the imaging and speed departments, but it also helps deliver an awful lot of sound without taking up anywhere near a commensurate amount of real estate. As the flagship of Paradigms Reference series, the Studio 100 v.3 inherently comes with a healthy dose of high expectations despite the fact that the word "reference" seems to be used quite liberally in audio circles these days. I have to say that I was quite skeptical upon unboxing these rather tall and slender floorstanders. Let me go through the particulars, and then Ill explain my skepticism. The first thing I noticed is that at 81 pounds each, these guys are no lightweights, but their weight is not out of line for higher-quality floorstanders that measure at or near 44 1/2"H x 8 1/4"W x 17"D. Not a small portion of the heft must come from the five -- yep count em -- five drivers consisting of a tweeter, a dedicated midrange, and three bass drivers, all designed and manufactured by Paradigm. The tweeter is a 1" satin-anodized, pure-aluminum affair, while the 7" midrange is made of a mica polymer that is a really cool and techie-looking semi-translucent yellow with a big aluminum phase plug stuck in the center. Lastly, the three identical 7" bass drivers consist of mineral-filled polypropylene cones, and I should also mention that all drivers use die-cast chassis. The woofers work together in this three-way design and cross over to the midrange at 300Hz, while the midrange hands off to the tweeter at 2kHz, both being of the third-order variety. A 3 1/4" front-firing port resides just below the bottom bass driver and sits approximately 9 1/2" above the floor. All those drivers result in a stated on-axis frequency response of 44Hz-22kHz (+/-2dB), which struck me as disappointing on the low end considering the multiple bass drivers. Then I saw that at -3dB the measurement dropped to a more befitting 28Hz. I was pleasantly surprised to see that despite all these drivers and the relatively extended frequency range, the Studio 100 v.3s have a stated in-room sensitivity rating of 91dB with a recommended power range of 15-350 watts. Ill borrow a phrase from my brother-in-law who lives in North Carolina and say that this level of sensitivity indicates to me that Paradigm has "put some thinkin" on this design. The impedance is said to be "compatible with 8 ohms," whatever that means, but since there was no minimum mentioned, it is not clear how well the Studio 100 v.3s will react to being driven by tubes. The speakers themselves seem very well put together. I could not detect a single flaw, and the sycamore vinyl finish on the sides and rear of the cabinets was very rich-looking and reminded me of real-wood veneer. In contrast, the top of the speaker is covered by a black plastic piece that is partially curved and formed to fit around what looks like part of the tweeters enclosure, and I do think it somewhat cheapens what is otherwise an expensive-looking speaker. Ditto the black plastic footer extensions at the bottom of the speaker. I also noted that although the cabinets seemed fairly well braced, the knuckle-rap test did reveal a little more hollowness than Ive heard from some of the competition. The last nit Ill pick is that the binding posts are set into the back of the speaker (someday I need to find out why so many speaker manufacturers do this) and the posts themselves seem like theyre pretty wide, although I couldnt actually see them. This made it impossible to see and difficult to feel what kind of connection I was getting with my spades, but in the end everything worked fine. There are two sets of binding posts per speaker, and Paradigm recommends biwiring, which I did. Finishing off, Paradigm makes much of the grilles, maintaining that they are engineered to eliminate edge diffraction and that the speakers are meant to be used with them in place. More on this in a bit. Setting up the Studio 100 v.3s was fairly easy -- they sounded best right where my own speakers reside. In this position they are situated about 6 1/2' apart and 9 1/2' from my ears. I toed them in such that drivers were pointed just outside my shoulders. Incidentally, this happens to be pretty close to what Paradigm recommends, although they would rather me add another half a foot or so of distance between the speakers. The front baffles were just under 5' from the back wall and a little over 4' from the side walls. Moving the speakers back did not improve imaging or coherence and served to overload my space with bass, which is a problem in my roughly 16'-square room. I was a little concerned having all those drivers situated in such relatively close proximity to my ears, but it proved not to be a problem, probably in large part due to the tweeter and midrange living only a few inches from each other. Apparently the review pair of Studio 100 v.3s had been previously broken in, although they looked for all the world like they came straight from the assembly line. Just to be sure I let them settle in as a home-theater speaker for a few weeks before I started any serious listening. So back to why I was initially skeptical of the Studio 100 v.3s. As I sat looking at the Paradigm towers after I got them situated, I found myself doing some mental math that just didnt seem to add up. Given the speakers' size, weight, and build quality combined with what look to be ten fairly expensive drivers staring me in the face and producing a near full range of frequencies, I couldnt reconcile internally how Paradigm could successfully bring that all together for $2200 USD per pair. I found myself mainly looking in the direction of those three bass drivers and that aluminum tweeter and thinking that I would surely find compromises with either or both once the serious listening began. I find the first time I sit down to listen to a new piece of equipment to be critical -- not because everything becomes apparent in those first few minutes; thats never the case or this reviewing gig would be much easier. But there are always one or two things that hit me immediately as different from what Im used to hearing, and these characteristics almost always follow through to the end of an evaluation and frequently become an important part of it. I find this to be especially true with speakers, which can sound so dramatically different depending on how they mate with associated equipment or a certain room. This case was no different, and what struck me as different right off the bat was the Studio 100 v.3s midrange. Now this is really saying something because to this point my Soliloquy 6.2s have trumped all comers in this pivotal area, especially in the lower mids where I find so many "affordable" floorstanders fall short. This was my first clue that there was something special going on here. That cool-looking midrange driver sure seemed to be more than a technologically pretty face. Next was that treble I had been so wary of upon first glance. It had that oft-elusive quality, at least in this price range, of being extended yet refined at the same time. But there was something missing. On further listening it seemed as if there was a slight lack of transparency and air in the upper regions that was softening transient edges and artificially truncating delicate reverb trails. I decided to go against Paradigm's directions and remove the grilles, and thus the fabric from in front of the drivers, to hear if that was hurting the cause. Immediately I got an extra dollop of air and reverb that largely restored what had been missing -- edge diffraction be damned. I left the grills off for the remainder of the review period. I found that Mighty Sam McClains XRCD Give It Up to Love [JVCXR-0012-2] was well suited to fleshing out the characteristics of the Studio 100 v.3s and happened to be the first disc I played during critical listening. This is a first-rate recording full of little nuances that make it useful as a reviewing tool, and McClains ultra-expressive and dynamic vocals can tell a lot all by themselves. "Lonesome Road" is simply a vocal track accompanied by acoustic guitar, and what was striking was the tonality present from the body of the guitar. The hollowness and woody-ness were much more predominant than Id heard before, almost as though the recording had been more closely micd, yet the snap and scraping of the strings was not overwhelmed. The result was a fuller sound and a bigger image of the guitar, almost as though it had been blown up a bit. In the middle of the song there is a strumming guitar solo that for me is one of those special moments in recorded music because on a good system you can feel the musical intent of the artist through the tension in the strings. When fully communicated I just naturally tense up through getting caught up in the performance, and the Studio 100 v.3s sucked me in more than Id ever been before. These are engaging speakers. The vocals on this track are also very emotionally and physically powerful, and the Paradigms were successful at digging down and surfacing all the soul McClain could muster and thrusting it into the room. There were times when the lower part of the vocal spectrum seemed slightly detached from the rest, and the air McClain expels with such feeling sounded just ever so slightly held back relative to what Im used to. But Id still say overall the Studio 100 v.3s provided one of the best renditions of Mighty Sams vocals Ive yet heard. Then theres "Got to Have Your Love," which involves more of the band. The song starts out with a little snare-drum-and-lightly-closed-high-hat combo, and here is where my previously mentioned concerns regarding the Studio 100 v.3's tweeter began to be put to rest. Not only was the metallic hardness inherent in the cymbals clearly portrayed, it was accompanied by a clean capturing of the tonal flavor and interaction of the top and bottom high hats -- I was able to hear and almost see them in my minds eye flopping in their stand. Toward the middle of the song there is a sax solo that kind of floats and dances just to the left of center and just behind the vocals, and as with the guitar, the instruments character was completely laid out, so it seemed that absolutely nothing was missed. Likewise the pianos soundboard was fully represented without sacrificing the physical sense of the hammers hitting the strings, and the result was a fully and realistically life-sized instrument that existed behind and all around the left speaker. This is probably a good point to mention the Studio 100 v.3s' ability to disappear in a room. I dont normally expect speakers of this size to be able to pull this off so convincingly, but I was surprised at the extent to which the Paradigms were able to act like little monitors in this regard. This is another area that I consider to be a strength of my reference speakers, and the Studio 100 v.3s pretty much matched them cloak for cloak. To further assess the Paradigms imaging capabilities, I pulled out Tony Falangas Soul of the Bass [Plane 88846] and punched up "Iberique peninsulaire," which features several different percussive sounds throughout that occur all around the stage. In particular are what sound like little wooden chimes in the far rear of the stage, and although the Paradigms placed them there, they didnt quite melt the front wall away to the extent of some other speakers. In general, the Studio 100 v.3s pull you up closer to the stage where everything sounds more present and robust, making differences in distance, while still very much there, seem just a little less dramatic. I also noted that individual instruments took on a more blended edge rather than a laser-sharp focus that almost seems unnatural by comparison. However I did note on "All or Nothing at All" from Diana Kralls Love Scenes [Impulse IMPD-233] that the stand-up bass featured at the beginning of the song almost seemed a little too bloomy and could have used a little more focus. What the Paradigms do extraordinarily well is bring a sense of size and scale to a performance, especially to larger arrangements. Whether it was Falangas double bass or a Mozart symphony, the Studio 100 v.3s laid a foundation and feeling of weight that made them sound like much larger speakers. This naturally takes us to bass performance, and my biggest criticism here is that my room simply wasnt up to handling the considerable capabilities of the Paradigms in this region. I know I was able to hear and feel very low bass lines more completely than I have with any speaker Ive had in my room to date, and the bass never seemed to lag behind the performance. I was, however, able to get the Paradigms to protest on the bass lines of "Postmodern Blues" from Patricia Barbers Modern Cool [Blue Note 7243 5 21811 2 4], but theres certainly no shame in that, and it was fun watching those six bass drivers working in unison. In the past Ive imparted a 90/90 rating to speakers of merit in the $2000 price range (and some even below $2000), which means that 90% of the people could likely listen to 90% of their music without feeling the need to add a subwoofer. All in all Id say the Paradigm Reference Studio 100 v.3s not only merit a 90/90 rating, they could actually be upgraded to a class-busting 95/95 -- an achievement indeed. My resident Soliloquy 6.2s are comparably sized and cost $2699 per pair, not quite 25% more than the Paradigm Studio 100 v.3s. But the Paradigms come away feeling and sounding like the bigger speakers. In my room this is both a positive and negative, as the added weight is more involving yet at times became a little overwhelming. Where the 6.2s had a clear edge was in upper-midrange detail and upper-treble transparency and air, which lent a better sense of spaciousness and light to a performance. While the Soliloquy speakers presented musical elements a more within a transparent space, the Paradigms placed them more against a silent backdrop. Both are convincing in their own way, but decidedly different. Cutting a finer line, Id also give the 6.2s a slight edge in front-to-back delineation and image focus and coherence. Despite the relatively slight lack of air, I still felt that the Paradigm tweeter was cleaner and more dynamic overall than the tweeter in my 6.2s. Although the 6.2s make a powerful argument in the midrange, I thought the Paradigms were able to take it a step farther in the lower midrange, giving them an advantage in expressing tonality and presence, especially of wooded instruments. And although the 6.2s do a credible job in terms of lower-octave extension, they just couldnt match the weight and power of the Paradigms six dedicated woofers. The indisputable bottom line is that both these speakers offer a level of quality and performance that represent extraordinary value for the audiophile dollar. In fact, they both serve up a good-sized helping of what the big boys offer, yet are different enough in character to appeal to different audiophile palettes. Given its high level of performance, refinement, and build quality, the Paradigm Studio 100 v.3 must be considered one of the greatest bargains in all of audio. From the bottom of its bass to the top of its treble and everything in between, the Studio 100 v.3 is a truly first-class effort capable of legitimately running with speakers twice its cost -- and maybe even more. Sure the cabinet could stand a little upgrading, but most audiophiles I know would gladly sacrifice a little wood veneer for whats inside, especially at the price of the Studio 100 v.3s. Other than asking for a smidgen more detail and image coherence, the only material reservation I can think of is that some people simply wont have the room to do these speakers justice -- myself included. But don't let this dissuade you from checking out the other models in Paradigm's Reference line. There's almost certainly a speaker there for you.